What is the investment focus/philosophy of your firm? What are the key drivers of automotive disruption? Can you talk about the role of big data and machine intelligence in AV? What business models have and will emerge as we adopt autonomous vehicles for on-demand mobility services? What needs to happen for these business models to be implemented and what sort of timeline are we looking at? Talk about some of the notable companies funded in the space and potential exits in the short-, medium-, and long-term? What do you think will happen to the large, incumbent automakers? Where do you find interesting big data and AI startups working on mobility-related problems outside Silicon Valley, Israel, and China? How do you identify areas to invest, create value for your portcos, and help drive exits? Advice for founders working on AV and mobility tech? Synapse’s focus includes big data applications using AI in industries such as telco, finance, and transportation. Synapse invests at Post Seed and Series A.
Synapse leverages relationships with key players and thought leaders. This surfaces the problems that can be solved with big data solutions. Analytics play a pivotal role in tracking potential startups. Synapse maintains a detailed database and scoring system to monitor specific companies and categories to invest in. Key drivers in automotive disruption are consumer mobility with increased urbanization, robotic assistance for an aging population, and the sharing economy of the new generation. Big Data and AI are enabling autonomy. They map the path for the vehicle and also personalize the experience. 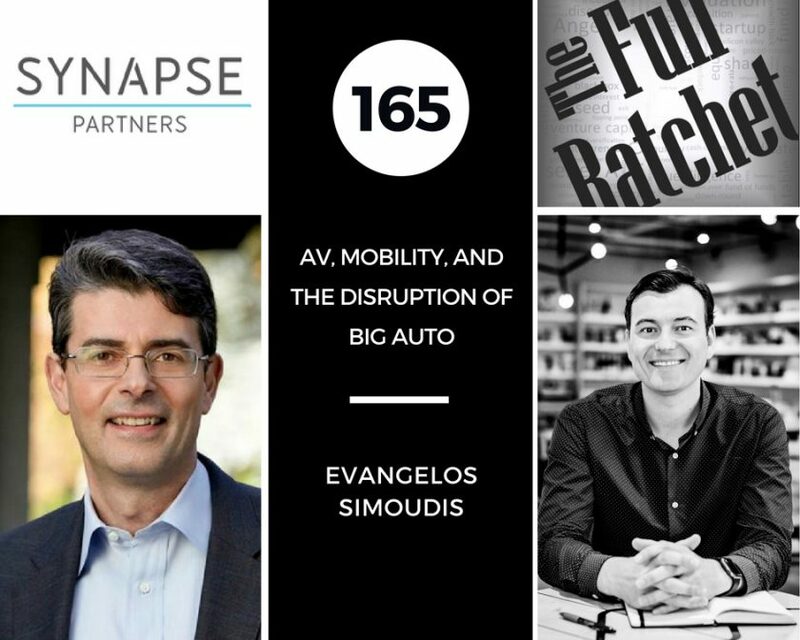 As investing in automated vehicles is capital intensive, Synapse focuses on enabling autonomy—finding technologies that will help corporations achieve their automation goals. There are a variety of business models that may be adopted with upcoming automotive services, including transactions, subscriptions, advertising, data, and fleet management. Evangelos believes that monetization will be repeatable by 2022 or 2023. The most important aspect of the business model is repeatability. While great progress is being made on the tech side of automation, many concerns remain unaddressed: privacy, infrastructure, liability, and cybersecurity. Without considering these factors, it is difficult to assess monetization. The inability to predict the movement of vehicles and individuals in cities may adversely impact exits. To reach the startups in other countries, Synapse finds local partners who share a similar investing approach. They have found that the startups with the most success come from areas with a large automotive presence such as Germany, France, and the UK. Many founders lack an understanding of how the automotive industry works. The phrase “Disrupting the automotive industry” should not be used. Instead focus on your startup’s key competitive advantage.